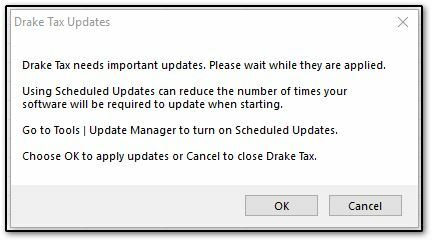 How can I set up scheduled updates in Drake Tax? 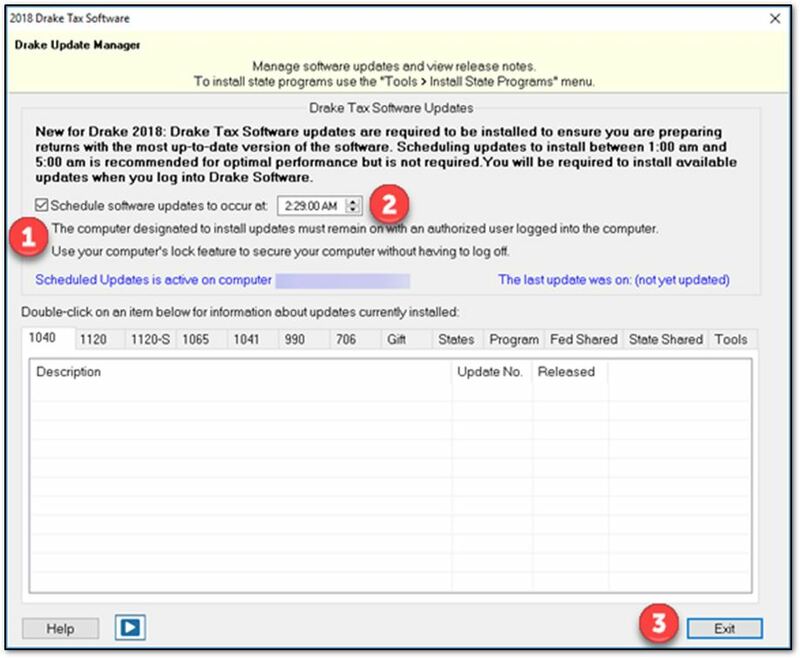 Setting up Scheduled Updates in the Update Manager ensures you have the latest updates in security for both Federal and State tax preparation. Scheduled Updates may be set to run overnight when there will be no conflict with normal office operations. Your software must be closed for updates to be applied. You must install available updates. Click OK on the message to install updates. After the updates are installed, we recommend setting up Scheduled Updates for future program updates to be installed at the most convenient time. Select the box to the left of Schedule software updates to occur at. Click Exit to leave the Update Manager. Updates will now run at the scheduled time. Be sure to configure Sleep and Hibernation settings on your computer so they do not interrupt your updates. Watch the video, Auto Updates (2018-Current), for a demonstration. Drake Software must be closed for Scheduled Updates to run. When using a network, Drake Software must be closed on all workstations and the server for Scheduled Updates to run. Drake Tax does not need to be running and a user does not need to be logged in to Drake Tax.